Ugly Form was the twin of JxiForms. JxiForms is one of our existing product. It is a form management tool designed to handle all the data posted on the online forms available on your website. "For eg. you have a community registration form on your website and every time a user attaches his picture in the form you can place that posted pic in your dropbox folder for easy access. This scenario is possible with the use of JxiForms." Completely based on the model of JxiForms we had the plans to evolve it into Ugly Forms (just like a pokemon) with a school of new features and possibilities. Once Ugly Forms would have been in place, JxiForms was to give way to it. Only Ugly Form would have been maintained by migrating all our existing JxiFormâs users to the advanced environment (only with their permissions). Why dropping the Development of Ugly Forms? We have always believed in fulfilling the requirements and the priorities of our users. Ready Bytes has always developed, completely based on the requirement analysis of our friends and users. All of our existing products are an example of it. Our products and services keep evolving to better fit you and your business. With the above intentions firmly in place we had placed a teaser page for Ugly Forms on our website as shown below. After hosting the webpage for almost three months and with regular communications with our users we discovered there is no longer a high demand for Ugly Forms. 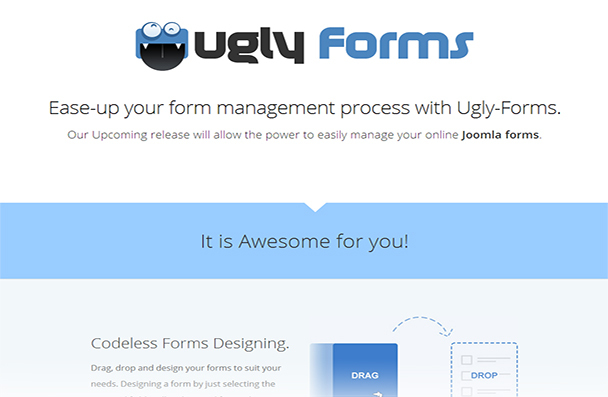 The Ugly Formsâ page never saw a rise in user interest and neither was it able to churn enough feedbacks from our users. It was bit of a surprise for us, as a form management tool in Joomla is voted as one of the highly required feature. It was a very tough call for us: "sunset" the product, or keep pouring the resources into it. Retiring a product our team had worked hard upon to support can tug at the corporate heart. We kept in mind, however, that the marketplace had spoken and our balance sheet didnât lie. So, we decided to move forward and drop the further development of a separate product. Next, we will continue with the development process of JxiForms as usual. Our experience, knowledge and learnings gained while developing the Ugly Forms will be gradually merged in the JxiForms itself. Users will be able to see the changes in JxiForms with its subsequent releases. We'll continue working to make your web presence better than ever. We sincerely apologize for any inconvenience cause to you. We will be glad if you please contact us with any questions or further doubts that you feel we need to clear.